Summer is at an end, though up on Mount Glorious we seem hardly to have had one.We lit the fire every night till mid December. Temperatures have rarely been above 25 degrees, and we still sleep with a blanket most nights. 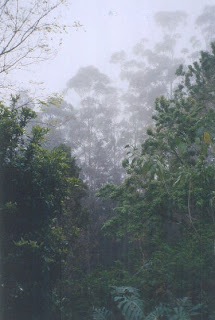 The gardens are lush with the summer rains (too much at times!) and the tanks are full. We’re looking forward to autumn bringing the daffodils and jonquils popping up all over. Late last year we found a rather sad looking young magpie on the driveway . He’s flying alright now, but seems to prefer walking! We’ve christened him (perhaps unkindly) Loser Bird. Some of you will be sorry to hear we recently lost our lovely cat Toby to kidney disease. We always feared for his safety when we brought him up the mountain, and thought it might be a tick or a snake that would get him.But even the snake that slipped into bed with him one night didn’t slow him down. Toby was a real favourite with our guests, and he always liked to check out who was staying in the cottage. I imagine he was given the odd treat when he visited! We’re going to miss the little fellow. 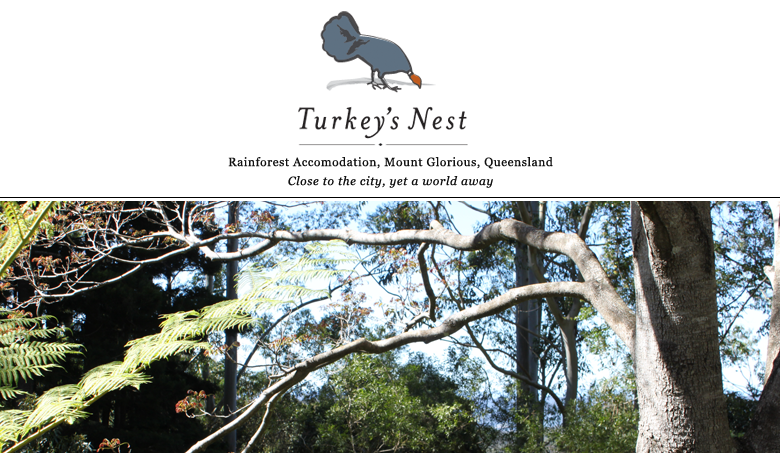 Turkey’s Nest is 15 acres of rainforest in the D’Aguilar Range, 45 km N-W of Brisbane. At 620m above sea level, it is much cooler than Brisbane, with fresh, clean air, mists in winter (and sometimes in summer), bright starry nights, beautiful rainforest and wonderful bird life. We bought Turkey's Nest a year after we married, and since then it has been our haven from the hustle and bustle of city life. We wanted to share the peace and tranquillity with others, and soon renovated the existing forestry cottage to create a romantic and peaceful holiday getaway for guests to enjoy. In 2008 we started building our own house and a second B&B cottage so we could finally move from suburbia and become more self sufficient. We are concerned about the environment and healthy living and the house is designed and built with environmental principles in mind. The house was partially completed by a builder and we are now finishing it off as Owner Builders. We are using light earth, a straw-clay mix, and many recycled materials in the construction, with the aim of making all new work on both our house and the accommodation as environmentally friendly and non-polluting as possible. Follow us on our blog as we create our eco home in the rainforest, and share our lifestyle with both our real and online guests!